The combination of a winter-time jet stream, warm tropical air and a full moon is turning Sandy into a huge and complicated storm that has the potential to devastate the Northeast and parts of the Mid-Atlantic. TODAY's Matt Lauer reports. 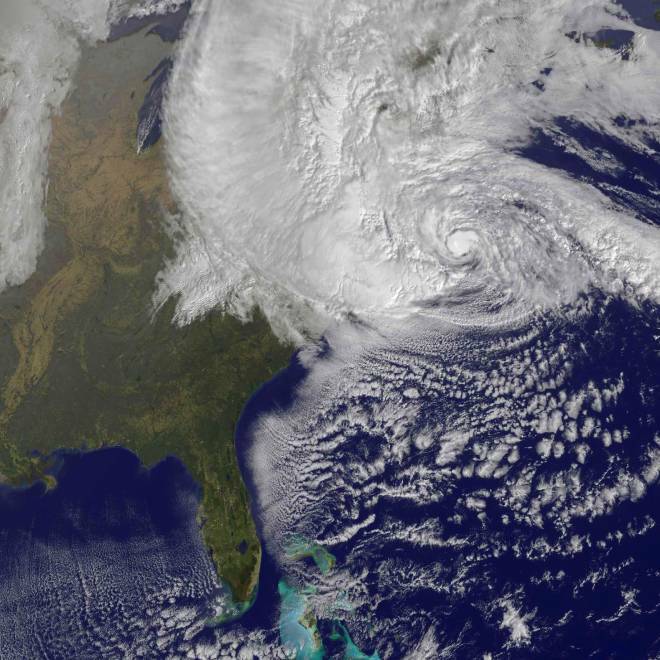 Hurricane Sandy is posing a monster challenge for weather forecasters and emergency agencies, due to an amazing combination of meteorological factors, but what's just as amazing is how well they've been able to predict what seemed to be an unpredictable disaster. "It looks like we've been fairly consistent on this, even five days out," Chris Landsea, science and operations officer at the National Hurricane Center in Miami, told me today. "I think when all is said and done, on the track forecast, we're going to be quite accurate." Sandy's path, which took a left turn from the Atlantic to slam head-on into the heavily populated Northeast, is just one of the unusual aspects of this storm. "The size of this system, the late-season nature, and the track — all these are fairly unique characteristics," Landsea said. To look for precedents, you have to go back to infamous hurricanes such as Agnes in 1972, Hazel in 1954, even the great storms of 1944, 1938, 1815 and 1804. But today, the region is so much more populous and developed that the impact is certain to be far greater. Northerly track: Atlantic tropical storms most commonly tear through the Caribbean and the Gulf of Mexico, and lose energy as they pass over the U.S mainland. This storm, however, crept along the Eastern Seaboard, where waters that were warmer than usual for this time of year kept the storm alive. As the storm moved northward, it morphed into a hybrid storm, drawing additional strength from the differential between the storm's warm air and cold northern air from the jet stream. "There's a transformation that this system is undergoing," Landsea explained. "This is actually evolving into a winter storm, and later, a nor'easter." One result of this evolution is that the storm system has widened to more than 800 miles in diameter, stretching from the Carolinas to Maine and Canada. NOAA's GOES-13 weather satellite shows the storm system associated with Hurricane Sandy covering the northeastern United States even before landfall on Monday. The left turn: Hurricanes that get so far north could drift off into the cold Atlantic to die — but they can also be pushed into the mainland, as Hurricane Irene was last year. Irene followed a path that was roughly parallel to the coastline, but Sandy took a hard left turn that put it on a course for a direct, perpendicular strike on the coast. That's because a cold front on the mainland is drawing the storm westward, while the current state of a weather pattern known as the North Atlantic Oscillation is blocking the storm from heading eastward. Storm surge: Sandy's top sustained winds of 85 miles per hour typically wouldn't rate as a superstorm, but its effects will be magnified, Landsea said. "Even though it's not a 'major' hurricane by any means ... there is substantial threat because of the storm surge and because of the rainfall. There's going to be flooding. Both of those factors are going to be killers," he said. The storm surge is projected to range from 6 to 11 feet. One of the big reasons for such a high surge is that the waters off the coast of New York and New Jersey are so shallow: As the surge from the deeper ocean nears the coastline, all that water piles up to create a higher wave. Full moon: Another reason for the huge storm surge is the fact that the moon is hitting its full phase just as Sandy is making landfall. The celestial lineup of the sun, moon and Earth contributes to higher-than-normal high tides. Winter storm: Sandy is such a late-season storm that it's running into winter weather in the northeastern United States, which is adding an extra dimension to the misery. "I have not been around long enough to see a hurricane forecast with a snow advisory in it," Craig Fugate, administrator of the Federal Emergency Management Agency, told NBC's TODAY. The storm could trigger up to 3 feet of snow in the Appalachians, the National Weather Service reported. The Weather Channel's Tom Niziol said that "an amazing combination of factors" have come together to make Sandy a threat due to the snow as well as the rain. Landsea and other forecasters may marvel at the factors behind what some have called a "perfect storm" or "Frankenstorm," and there'll surely be lots of lessons learned for future weather modeling. But that's not what's uppermost on their mind right now. "What's really important are the impacts," Landsea said. Update for 3:10 p.m. ET Oct. 30: The storm surge was clearly one of the biggest impacts of Hurricane Sandy, and for good reason: The National Hurricane Service reported that in some cases, the surge exceeded its own maximum prediction of 11 feet. At New York's Battery Park, for example, the surge measured 13.7 feet — and it was devastating. On another note, I've corrected the spelling of Landsea's apt last name since this item was originally published. Alan Boyle is NBCNews.com's science editor. Connect with the Cosmic Log community by "liking" the log's Facebook page, following @b0yle on Twitter and adding the Cosmic Log page to your Google+ presence. To keep up with Cosmic Log as well as NBCNews.com's other stories about science and space, sign up for the Tech & Science newsletter, delivered to your email in-box. You can also check out "The Case for Pluto," my book about the controversial dwarf planet and the search for new worlds.